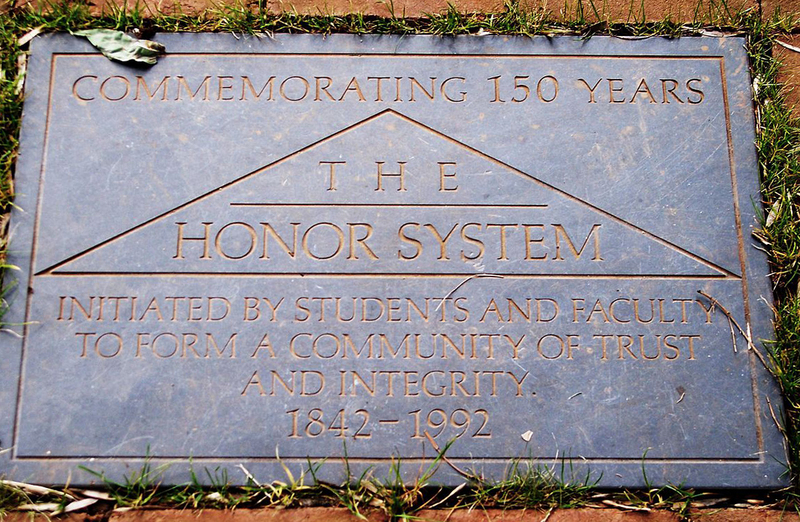 Besides reminding students of the university’s Honor Code—and its enforcement body, the historic, student-run, Honor System—notices like these serve a more elementary (and obvious) purpose: to encourage individuals to refrain from dishonest behavior. A number of studies have demonstrated that moral standards are not self-executing, and that even the most upright person benefits from reminders. In one experiment in 2008, subjects who recited the Ten Commandments before taking a test cheated significantly less. There may be a consensus that dishonesty is bad, but that is not enough; the standards must be kept top of mind. Like so many other aspects of our society, the idea of teaching honor and integrity has undergone a change, especially in the area of higher education. Colleges have elected to address student cheating in a variety of ways. At Hamilton College, peer proctoring is the norm; at Haverford College, cheaters must apologize to the entire student body via email; at Middlebury College, touting the honor code is a way to sell the college experience to visiting parents but not something strongly enforced. UVA’s honor code is considered effective but, according to its detractors, excessively punitive (one strike and you’re out, also known as single sanction). But the new one isn’t working either. During my tenure at Johns Hopkins University, where I earned a PhD in mathematics and served as a teaching assistant in undergraduate math courses for three years, I witnessed a shocking array of dishonest acts. In one semester, more than half of my calculus students copied answers verbatim from the solution bank Chegg, a website which advertises “Homework Help.” (Ironically, Chegg was not helpful at all; in many cases, its solutions are wildly off.) During exams, I often saw eyes wandering onto neighbors’ papers and I intercepted numerous smuggled notes. One student made six visits to the bathroom during a two-hour final exam. More troubling yet was the unspoken culture of omertà. Every attempt I made to reform the culture in the math program was stymied and every complaint was rebuked. My fellow graduate students opposed my plan to inform the authorities of suspected incidents of academic misconduct, citing a reluctance to “go around the professors.” The faculty members insisted on “settling the matter internally,” which apparently meant keeping the misconduct quiet. And when I wrote a letter to the dean—I did not demand punitive action; I only requested an investigation—I encountered resistance. If my university had had an honor system, the tasks of gathering evidence, tracking down the accused, arranging face-to-face meetings, explaining the charges, selecting a sanction, and eliciting confessions would not have fallen to an inexperienced teaching assistant like me. Rather, these functions would have been handled by trained, unbiased groups with a host of resources available to them. Without an honor code, my university quite simply lacked the infrastructure to pursue complaints. A common criticism of honor codes is that integrity ought to be a given. An explicit statement of morality should not be necessary. But UVA’s honor code—in fact, the honor code at any university—is predicated on the belief in students’ essential virtue and that the mission of the university and the individual’s own flourishing are best served when accountability for misconduct rests not with professors but with peers. Rather than begin by accepting students’ fundamental orientation toward virtuous behavior, Johns Hopkins cultivated an atmosphere of mutual distrust between professors and students, one ripe for rampant cheating. In fact, things devolved into a near-police state. Students were routinely required to show school photo-identification cards and to sign their names before handing in their tests. One fellow TA compared exam proctoring to duty in a Panopticon. The climate was harsh—almost militaristic—but even these drastic measures were ineffective. Students were never expected to acknowledge the simple premise that they were there to learn and that their work should be their own. And so cheating persisted. “As confidence in our social institutions collapses,” UVA professor Chad Wellmon recently observed, “the university is, at least in theory, ideally suited to be a beacon of public discourse and democratic and intellectual ideals and virtues.” UVA English professor Michael Suarez says, “Honor calls us to be honorable to each other, not merely by not committing transgressions, but also by doing reverence to the other in our midst.” The answer it seems is that, yes, honor codes can offer a better model for moral formation in the modern university. Benjamin Diamond earned his PhD in mathematics from Johns Hopkins University in 2017.